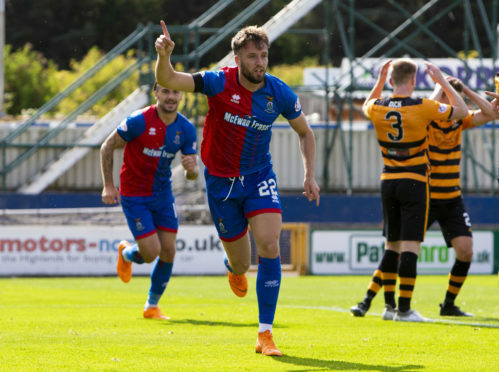 Caley Thistle defender Brad Mckay says reaching a century of appearances with Inverness marks a vast turnaround in his career from the lows of his spell with St Johnstone. Mckay played his 100th competitive game for Caley Jags in Saturday’s 4-0 Scottish Cup fourth round victory over East Kilbride, which helped Inverness secure a last-16 tie away to Highland rivals Ross County next month. The 25-year-old’s milestone comes less than two-and-a-half years since Richie Foran signed him from Saints in August 2016 having made just six appearances during his 12-month stint in Perth, during which he also spent time on loan with Dunfermline. Mckay insists he has rediscovered his love of football at Caledonian Stadium. He said: “To get 100 appearances is a big turn – I’m thankful to both managers I’ve played under here. “It was a proud moment, given where I was in my career at St Johnstone at one point. I was in the depths of hell, I was getting taken to Ross County away and sitting in the stands. Sometimes I was not even making the squads. “You are never sure – sometimes it feels right at a club and sometimes it does not. At St Johnstone it felt right for me, but it never worked out. Despite suffering relegation from the Premiership at the end of his first season with Inverness, Mckay feels current Caley Jags boss John Robertson – who previously held a coaching and ambassadorial role with Hearts when the defender was at Tynecastle – has restored the feel-good factor at Inverness. Mckay added: “When we were toiling in the top league, we had a good enough team to stay up. We 100% should have. Things happened in and around the club, the chairman changed and there was a lot of stuff going on behind the scenes which the players didn’t appreciate and know about. “There has been a lot of change but I was at Hearts when when the club went into administration when I was younger, so change is not alien to me. “The manager has come in and he’s been fantastic.He has shown faith in me, so every time I go out there I try to do the same for him.